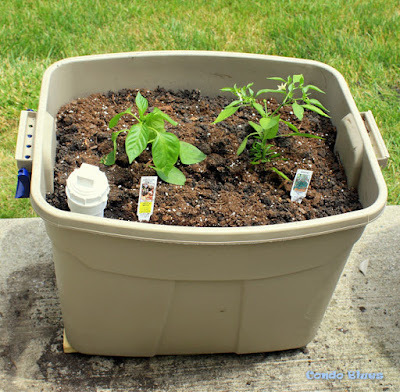 This is a quick and easy build because you are basically making a wood slip cover for an ugly self watering planter box. 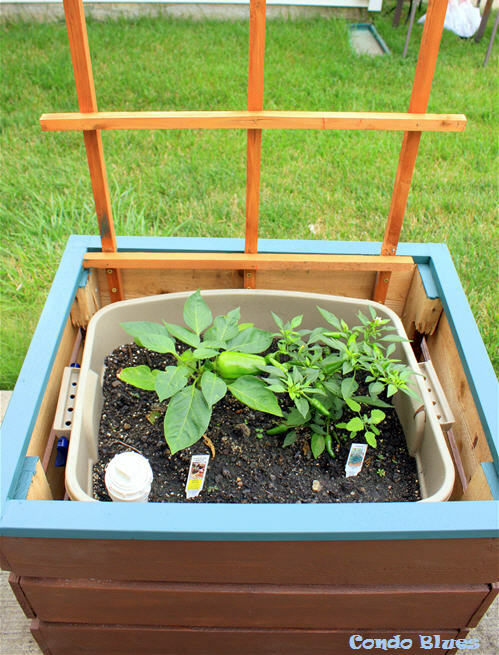 The self watering planter box doesn't need to be sturdy to hold heavy soil, which means I can skip using screws and bust out my nail gun. Pew! Pew! Pew! I build my planter box from cedar because cedar is naturally pest and weather resistant. Cedar boards are fairly expensive but cedar fence pickets are not. I bought my cedar fence pickets for about 2 bucks each on sale. Disclosure: This post includes affiliate links for your convenience. I put my planter box on top of two pressure treated boards to lessen the chance of the tub freezing and cracking on the cold concrete patio during the winter - I hope. 2. Use the compound miter saw to cut two sets of six cedar fence pickets for the front and back sides running the length of the planter using the measurements you took in Step 1. I cut my front and back pickets 25 inches long. 3. Use the compound miter saw to cut two sets of six cedar fence pickets for the two side panels that will run the width of the planter using the measurements you took in Step 1. I cut my side panel pickets 20 1/2 inches long. Hi everyone Lacey here! Please make sure you wear your safety glasses and take all saftey precautions when you are using power tools to build this project. As you can see, I had to keep a close eye on Lisa to make sure she didn't hurt herself. 4. Use the compound miter saw to cut four 2x4 boards to make the four corner legs of the planter box. I cut my corner legs 18 inches long. I used pallet wood from my stash instead of 2 x 4s since the legs aren't going to hold weight, they are just there to make a box. 5. 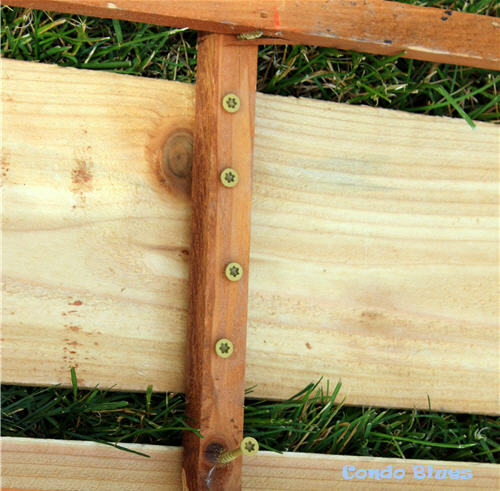 Use the nail gun to nail the ends of three cedar pickets to two of the corner legs to make the front panel of your planter box. 6. 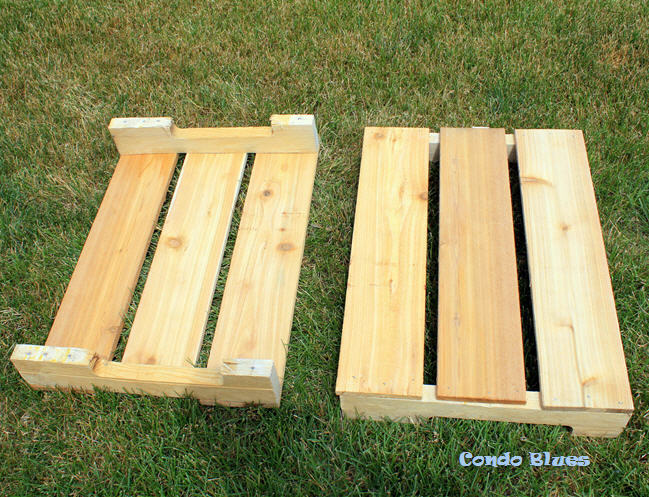 Repeat the directions in Step 5 to make the back panel of the planter box. 7. 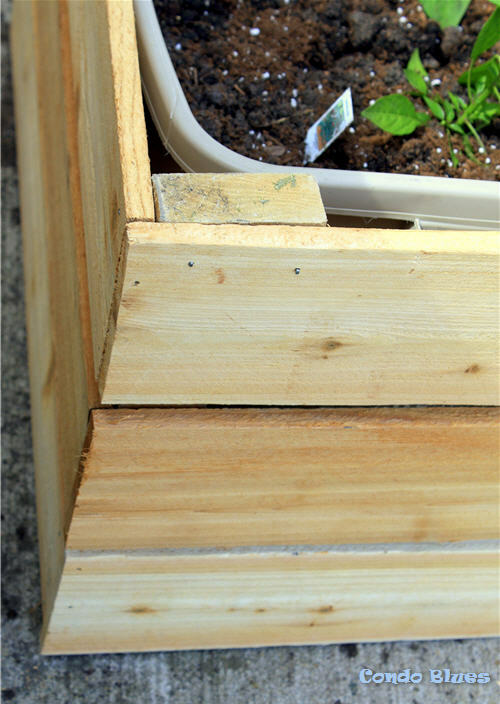 Use the wood screws and screw gun to attach the wood trellis to the inside back panel of the planter box. I used screws instead of nails to make sure the trellis is sturdy enough to grow heavy vegetables on it if I choose. If you are a better woodworker than me (and you probably are) you would have a straight line of screws instead of my wonky one shown here. Fortunately, it is on the inside of the planter box and no one will see it. Tip: The staples holding the wood trellis together came apart almost immediately after I got it home. I drilled small pilot holes at each cross section and screwed them together with small outdoor wood screws and a hand screwdriver because I didn’t want to risk accidentally splitting the wood. It worked. 8. Use the nail gun to nail the ends of three short cedar slats to the front and back planter box panels corner posts to make a box. Congratulations! You made a box! 9. 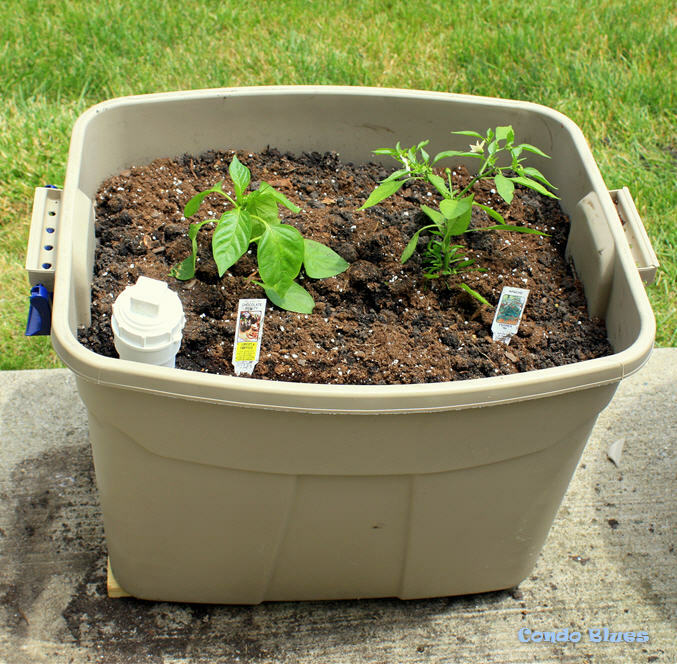 Put the plastic self watering planter inside of the wood planter box. 10. Cut 2 2x2 boards using the measurements in Step 3 and 2 2x2 boards using the measurements in Step 4. This will become the top lip of the planter box. 11. Use the nail gun to attach the wood trim to the top of the planter box. 12. Optional: Sand the planter with the random orbital sander (I knocked back the rough fringes and left some texture instead of sanding it perfectly smooth) and use the paintbrushes to stain the planter box with outdoor wood stain or outdoor paint if you like. 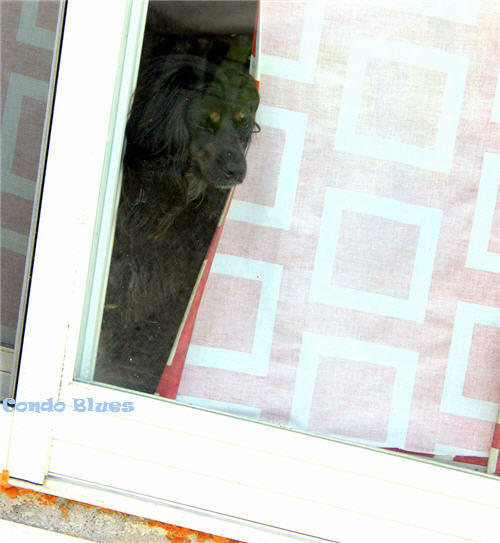 My unofficial Instagram poll (follow me @condoblues on Instagram pretty please?) was split down the middle about staining the box or leaving it unstained. I decided to paint and stain the cedar on my planter box when I saw my favorite color stain (color 50 cents on the mistint shelf) for sale at Lowes. I painted the top trim green to coordinate with the green pots I painted a few years before. 13. Plant, water, and watch the flowers grow!